For all the madness that’s been driving the world of cryptocurrencies higher, this past week seems to have introduced the first stumble in quite some time. In the stock market, there was also a stumble of sorts, perhaps the sign that expectations were out of sync with actual results. In either case, the lesson the markets always come back to is real results – which is something Canadian online brokerages are focusing more intently on heading into the end of the year. In this week’s roundup, we take a look at some of the latest features launched by one online brokerage which will be sure to get the attention of other Canadian discount brokerages as well as DIY investors. From there we take an interesting snapshot of the latest events and developments in the online brokerage space as seen from social media. As usual, there’s also a lot of DIY investor commentary to be had in the discount brokerage tweets of the week and chatter from Canadian investing forums. Heading into the end of the year, the activity level at Canadian discount brokerages is showing no signs of slowing down. This past week, some very important changes were rolled out at Qtrade Investor, one of Canada’s remaining non-bank-owned online brokerages, and a usual top ranking online broker in the Globe and Mail discount brokerage rankings. The first, and arguably most salient improvements for DIY investors, is the removal of certain fees and fee thresholds. Qtrade Investor has now removed a quarterly administration fee (of $100) so long as individuals set up a recurring electronic transfer of at least $100 per month. In addition, Qtrade Investor has also removed the minimum deposit requirement (of $1,000) to open a new account. 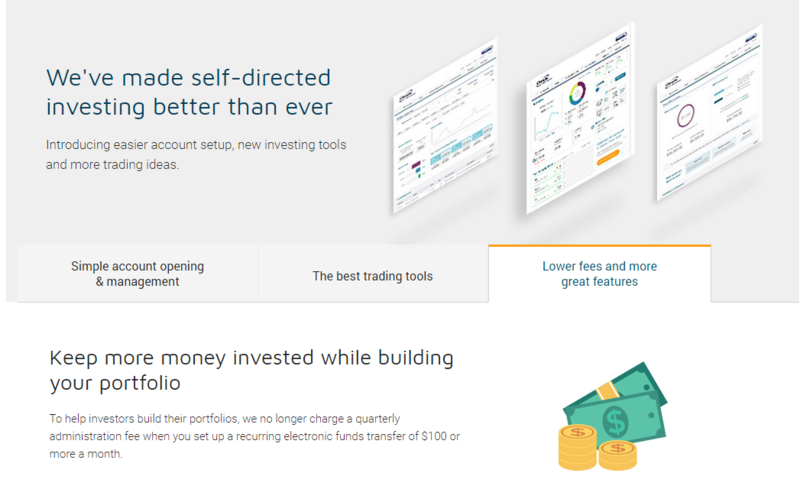 These latest improvements are in line with recent enhancements to the online account opening process in that they also help to streamline account opening, especially for younger investors (most likely to have more modest portfolios). As a bonus to dividend investors, Qtrade Investor has also updated its dividend reinvestment plan interface to make it easier to identify stocks that are eligible for DRIPs. On a technical note, there are additional features which have been announced including a handy registered account centre that makes it easier to track contributions and withdrawals as well as additional portfolio tracking tools. The full list of improvements and new features are available here. Also, be on the lookout next week for the release of exclusive features/content from Qtrade Investor as part of the SparxTrading.com online brokerage year in review series. There are certainly tough gigs, however crawling through social media for content is not one of them. While it did take some restraint to avoid trending hashtags, listicles and the never ending …., we did manage to pull some interesting social media posts from or about Canadian online brokerages. 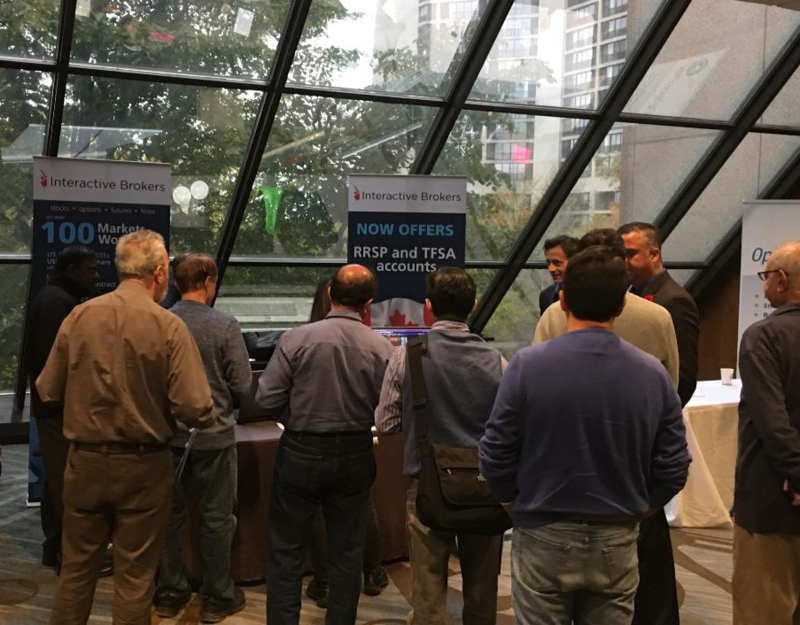 This past week there were photos posted from the Toronto edition of Options Education Day which took place on November 4th. This was the last and largest of four events held across Canada and, interestingly enough, was the only one in which pictures were posted to social media. Both National Bank Direct Brokerage and Interactive Brokers Canada were sponsors of this event. 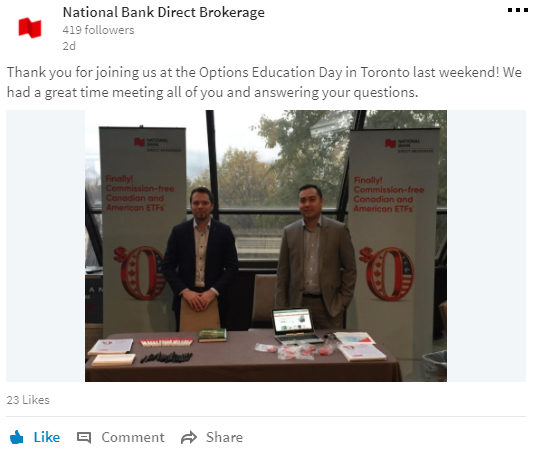 Spotted on the National Bank Direct Brokerage LinkedIn page was a snapshot of NBDB reps ready to field questions about options trading. Also from the day were pictures from the Montreal Exchange’s Twitter feed which included shots of a very busy looking Interactive Brokers Canada table. 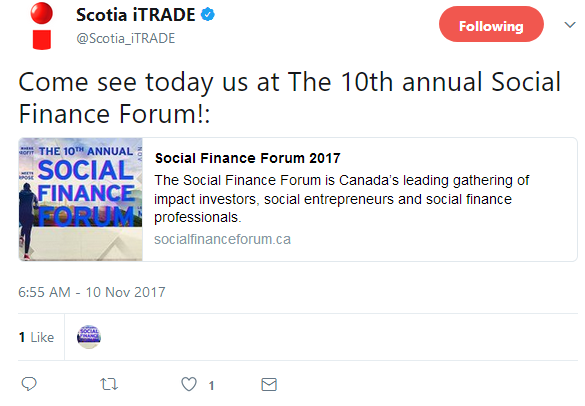 Also spotted on Twitter this past week was a tweet from Scotia iTRADE announcing their participation in the 2017 Social Finance Forum in Toronto. The tweets and coverage on social media from this forum were interesting for a number of reasons. First, it was definitely interesting to see the number of firms and individuals who are active in the social finance space. The tie-in for Scotia iTRADE is in line with initiatives they launched earlier this year on socially responsible investing. Another notable observation is that investors were in attendance and sought out this conference as a way to put their investment dollars behind projects that hold meaning to them. 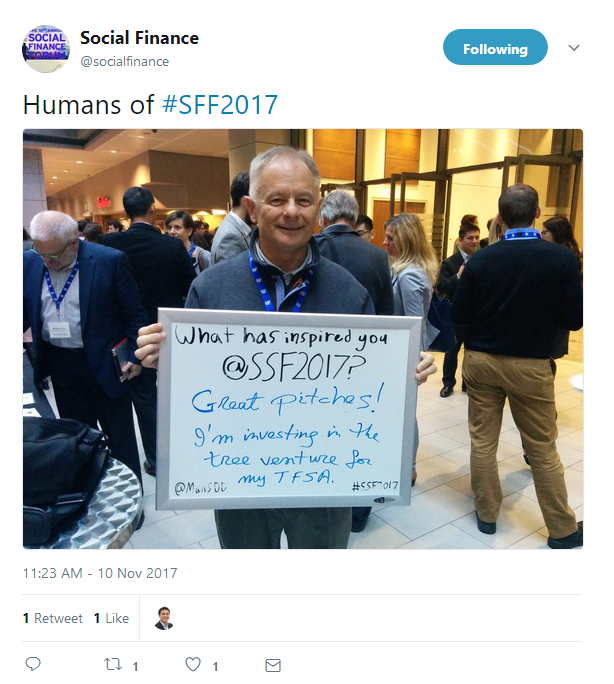 As the picture below shows, this conference offered one investor an idea of where to invest in a TFSA. It will be interesting to monitor the trend towards socially responsible investing to see if other Canadian online brokerages not only start deploying these investment tools and options to their clients, but also to monitor whether they also start to show up in a more visible fashion on social media and at events like the Social Finance Forum in the future. 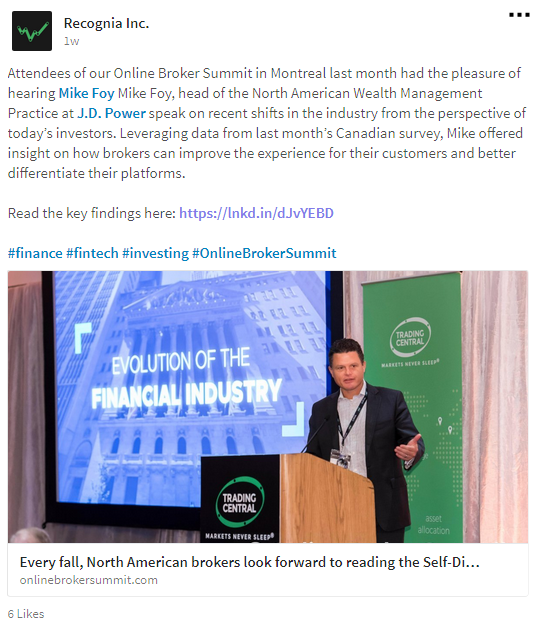 Last month, online brokerages from across North America and across the globe converged in Montreal for the online brokerage summit. Produced by Trading Central/Recognia, this annual event taps into industry participants and commentators to take a snapshot of the state of the industry as well as where the trends are for DIY investors. Spotted recently on the Trading Central LinkedIn feed was an interesting and insightful blog piece written by Mike Foy, from J.D. Power and Associates North American Wealth Management Practice, on some of the emerging trends and ‘disruptors’ in the online brokerage marketplace. Technical issues and customer service woes made their way onto Twitter this past week across the board. Mentioned in this week’s tweets were CIBC Investor’s Edge, Credential Direct, Questrade, RBC Direct Investing, Scotia iTRADE, TD Direct Investing, and Virtual Brokers. As the world becomes increasingly interconnected, there’s also an increasing interest in looking further abroad for trading opportunities. In this post from reddit’s Personal Finance Canada subreddit, there was an interesting commentary on the realities for Canadian DIY investors looking for online brokerages that let you trade international markets. Record keeping is something that is very important for DIY investors to get right. Nonetheless it would be nice if online brokerages could figure out a way to make this easier. This post, also from reddit’s Personal Finance Canada thread, highlights the limitations encountered with one bank-owned online brokerage in trying to access historical trading data. That’s a wrap for this week’s roundup. Wherever the weekend takes you, we hope it’s a safe and enjoyable one. 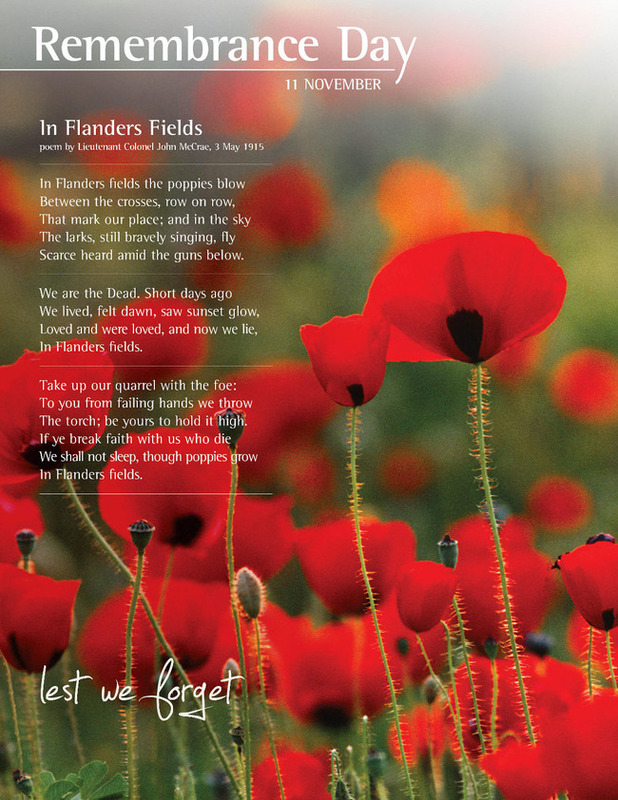 Of course, we also hope and encourage everyone to take some time over the weekend to remember and pay tribute to the brave women and men who made the ultimate sacrifice defending our freedom.